Here is a very useful utility Windows 7 Product Key Checker which lets you to check and verify your Windows 7 Product key. Windows 7 Product Key Checker is an easy to use application designed to offer you a full description of the every fields of the product key, Product ID, Extended PID, Activation ID, Edition ID, License Type, License Channel, and Crypto ID. The PID is the product id assigned to each oem manufacturer by edition (ie Home Premium, Ultimate, etc.). 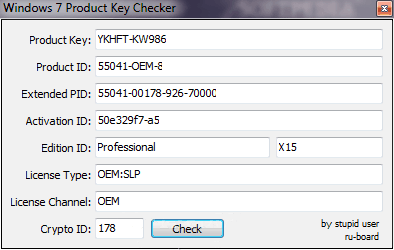 You can find the PID for a product key by using the online PID checker: Windows PIDchecker.